It has been said (and often required by recruitment agencies) that system administrators need to be proficient in a scripting language. While most of us may be comfortable using Bash (or other shell of our choice) to run command-line scripts, a powerful language such as Python can add several benefits. To begin with, Python allows us to access the tools of the command-line environment and to make use of Object Oriented Programming features (more on this later in this article). On top of it, learning Python can boost your career in the fields of desktop applications and data science. Being so easy to learn, so vastly used, and having a plethora of ready-to-use modules (external files that contain Python statements), no wonder Python is the preferred language to teach programming to first-year computer science students in the United States. In this 2-article series we will review the fundamentals of Python in hopes that you will find it useful as a springboard to get you started with programming and as a quick-reference guide afterwards. That said, let’s get started. By the way, it is important to note that although versions 2.x are still used, they are not actively maintained. For that reason, you may want to consider switching to 3.x as indicated above. Since there are some syntax differences between 2.x and 3.x, we will focus on the latter in this series. Once installed, you will see the following screen after launching the IDLE. While it resembles the Python shell, you can do more with the IDLE than with the shell. 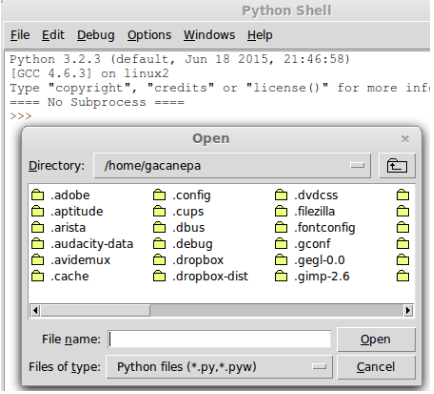 1. open external files easily (File → Open). 2) copy (Ctrl + C) and paste (Ctrl + V) text, 3) find and replace text, 4) show possible completions (a feature known as Intellisense or Autocompletion in other IDEs), 5) change the font type and size, and much more. On top of this, you can use the IDLE to create desktop applications. 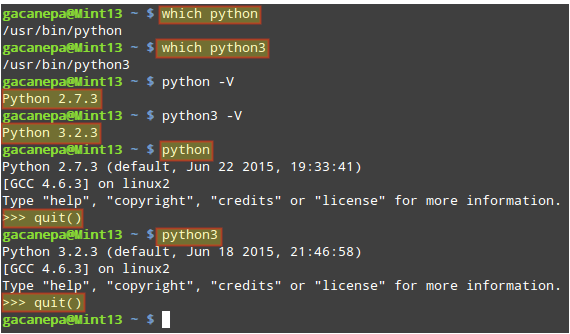 Since we will not be developing a desktop application in this 2-article series, feel free to choose between the IDLE and the Python shell to follow the examples. Please, whatever you do, *do not touch the system Python installation! * This includes modifying symlinks or paths or whatever. Large parts of your operating system depend on a particular Python version in the /usr/bin/ directory, be it 2.x or 3.x. This is why some users in the comments report broken functionality. Always, always, always use virtual environments which allow you to use whatever Python and third-party package versions you want in an isolated location. Anything else can seriously screw up your distribution. Warning: I don’t know why but wicd stops working if you modify the symlink for python3.x to python, effectively breaking your ethernet / wi-fi. I am new Linux SysAdmin and I am going to use Python for scripting language so, I Googled about it before but i did not find anything useful for someone like me. would you give me some direction for starting python actually for Linux-system administration? Just as note. As sysadmin never remove python 2. One of the utilities that will break will be yum. Seriously Gabriel? That’s like posting “If you’d like to increase space on your hard drive, you can use “rm -rf /” and then saying that you” didn’t actually recommend it.” when someone points out it deleted their entire hard drive. Novice Linux users come to sites like this and follow directions; “clarifying” potentially damaging instructions after the fact isn’t very useful. You should, at the very least, insert a clear cautionary statement. Better yet, move this “suggestion” and the “clarification to the suggestion” adjacent to each other AND include a cautionary statement that it can break packages on some common distros. Thank you for your comment. Stay tuned for more great articles and useful tips!